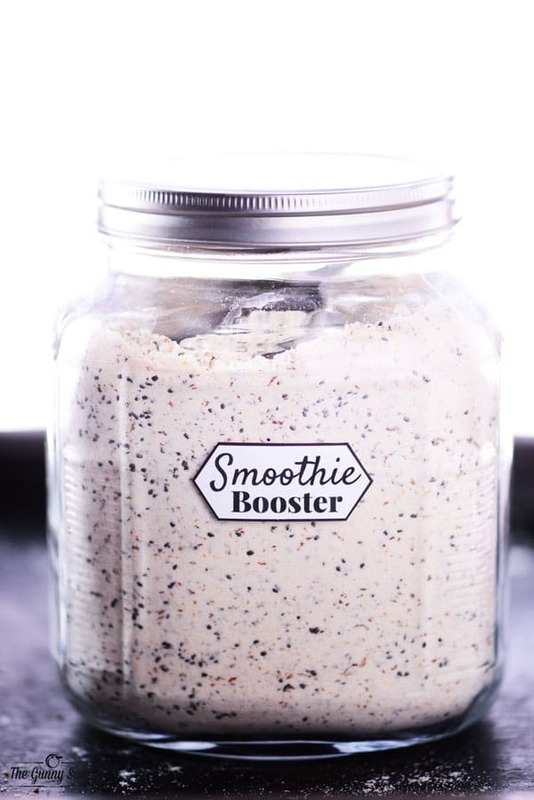 Make mornings easier by premixing this Smoothie Booster recipe with protein powder, chia seeds, and ground flaxseed so that is ready to go in just one scoop! Ahhh…January! The time of the year when we all try to be nice to our bodies by making up for all the damage we did over the holiday season. It’s actually something we should try to do all year long and one of the easiest ways to put the good stuff in, is to make smoothies. My family isn’t the best at eating their fruits and vegetables, especially the guys in the family. So, at the start of the school year, I bought a BlendTec blender and started making smoothies in the morning. 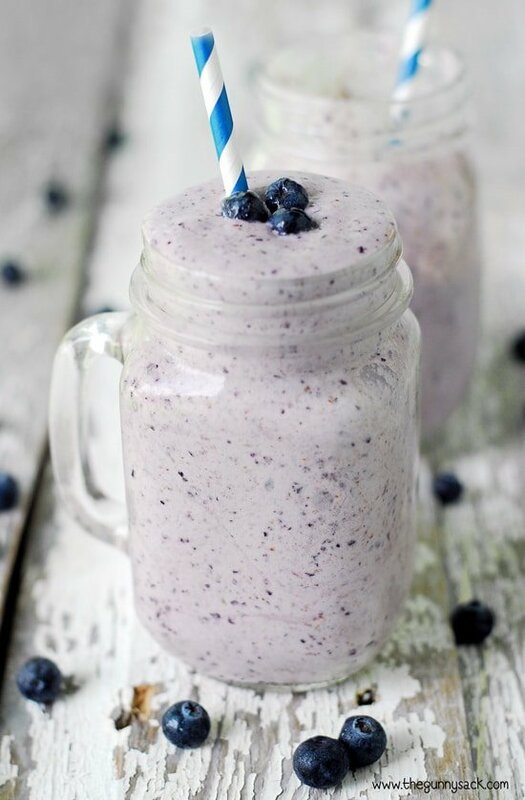 Our typical smoothie has water, yogurt, fresh spinach, frozen fruit, protein powder, chia seeds and ground flaxseeds. 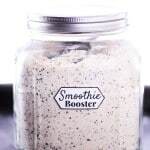 I finally decided to make things a little easier by premixing those last three ingredients to make a Smoothie Booster that is ready to go in just one scoop! Put the protein powder, chia seeds and ground flaxseeds into a bowl. 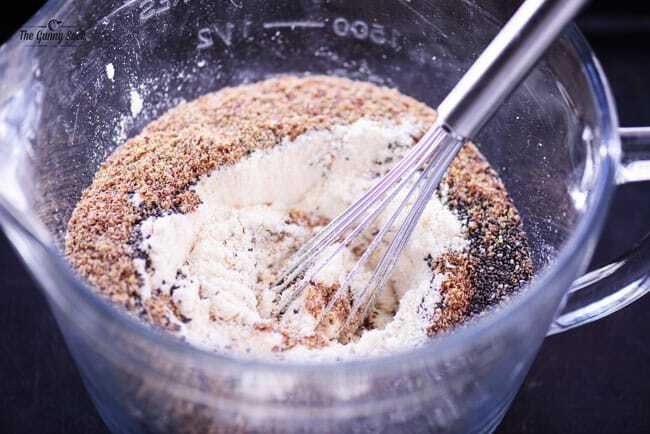 I used this cake batter protein powder, these organic chia seeds and this ground flaxseed. Whisk it all together until the seeds are evenly distributed. 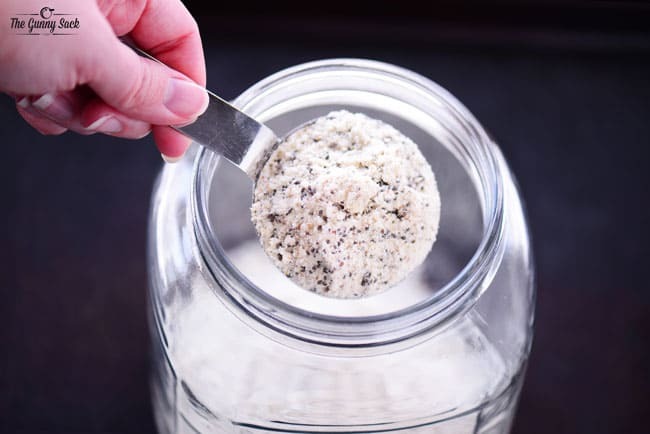 Put it all into a large jar, add a label and stick a scoop into the jar for easy use. I used this jar, this label and a 1/4-cup measuring cup for the scoop. The size of the scoop you put into YOUR jar will depend on the size of the scoop in your protein powder. My cake batter protein powder scoop is about 1/3 cup. Now, when I am ready to make a smoothie in the morning, I put the water, yogurt, spinach and fruit into the Blendtec and top it off with a scoop of this Smoothie Booster. IMPORTANT NOTE: Please check the serving size of YOUR protein powder and adjust accordingly. My container says to use 1 rounded scoop and that is about 1/3 cup but all brands will vary. 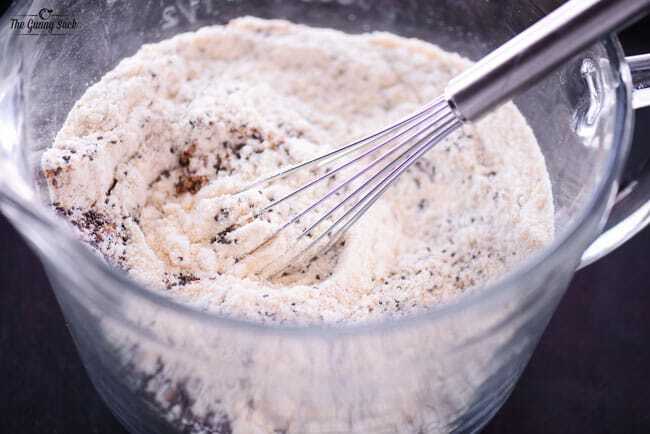 Put all three ingredients into a large bowl and whisk together until evenly distributed. 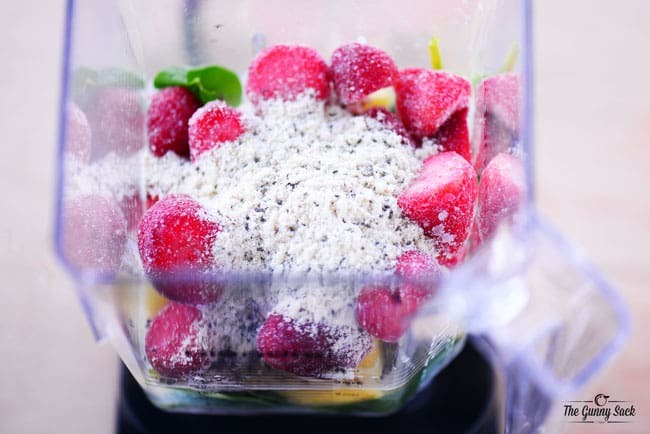 Add a scoop to your smoothie before blending. Can I use ground chai seeds in place of whole chai seeds? Yes, but I would suggest using half of the amount. Enjoy! Why are you using LESS (1/4 cup) of the mixture of ingredients than you used of the protein powder alone (1/3) cup? 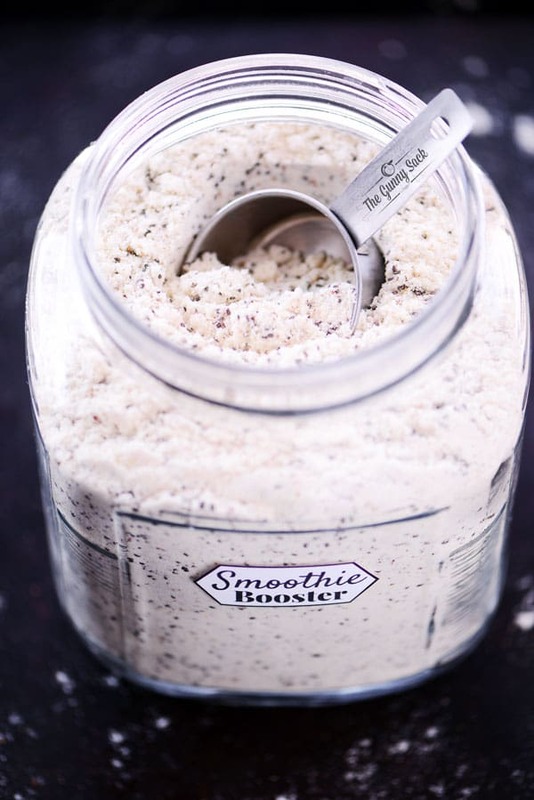 Don’t get me wrong, this is a great idea…..but I use 1 scoop protein powder, 1 scoop peanut butter powder and 1 scoop ground flax. I’m just confused as to how to get the same amount when mixed together. Thanks! I don’t use protein powder (or flaxseed or chia seeds) like a prescription with exact measurements. My kids don’t like it when our smoothies have too much protein powder because it changes the flavor and texture. So, I usually only use 1/2 scoop protein powder when making a four serving smoothie in my Blendtec. If you want to be precise about your measurements, I wouldn’t use this method. If you want to speed up your morning routine, I would suggest putting your 1 scoop protein powder, 1 scoop peanut butter powder, and 1 scoop ground flax into small containers with lids (something like this http://amzn.to/2kXgdYQ ). Then when you want to make a smoothie, you can just grab one container. Best of luck! So I am getting ready to place a order of those item. By question is: what ever is left from mixing the amounts in the jar. What do I do with them? How long do I keep it before it goes bad? I’m trying to eat better, I’m not sure how fast I’ll go through this stuff ? 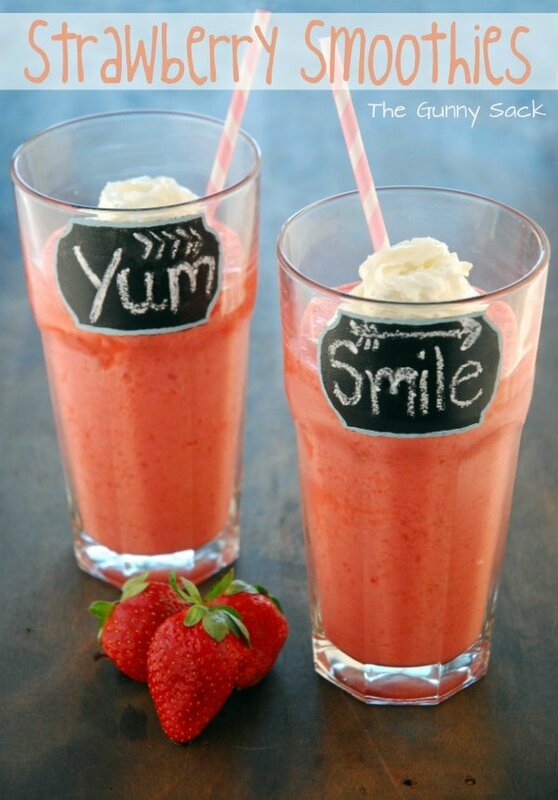 If I am making one to 2 smoothies a day. My favorite is peanut butter and coco and bananas. My package of cake batter protein powder has an expiration date of two years from the date of manufacture. My chia seeds have an expiration date of about a two years from when I bought them. We store both of them on a cool, dark shelf. I am currently out of flaxseed meal so I can’t check the package but we store it in the fridge. I was telling my sister about what you do. I was able to buy 2 of my items in the store, I placed a order for my other two item. She asked my why do you mix them together when you do that it’s hard to make sure your getting the right amount in each smoothie? Also why you put it in the fridge ? ? Thank you for helping me out. Just want to make sure I’m doing it right and not going to cause it to go bad. Could you put a link to the jar you are using for storage? Also, what do you think the shelf life for the mix is? Sorry. Just saw the link to the jar. Thanks! What kind of protein powder are you using and is it flavoured? Great idea that will definetely save time by not having to drag everything out and measure seperately! Keep in mind that the nutrition info will change on the 1/3 scoop because you now have 3 ingredients rather than just the protein powder. It surely wouldn’t hurt to store the jar and these ingredients in the fridge, especially if you don’t use them very quickly. I’ve read that ground flaxseed can go rancid very quickly if not refrigerated. It is more economical to buy the seeds, which will last longer, and then grind them into meal with a coffee grinder as needed. Leading science dr Greger says it’s very stable on the shelf for 6 months. Why would this need to be stored in the refrigerator when none of the ingredients are normally stored there? Hi Sharon! My ground flaxseed package says that it is supposed to be stored in the fridge once the package has been opened. Your package may vary though. Best of luck! Neat way to simplify morning smoothie making. Those chia seeds are really good, same brand I’ve been using for years.